Broxden has a range of facilities, most not normally found near a motorway, at the very northernmost point of the motorway network. Broxden is a really confused site: for a start it's signposted as a TRSA, usually mapped as an MSA but treated as though it's just a group of convenient facilities. A park and ride site is accessed through the services. 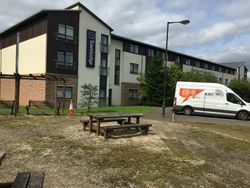 MFG operate the filling station and Travelodge operate the hotel. 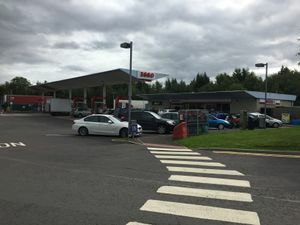 A service area had been planned in this location since the early '90s, with Esso repeatedly applying for permission to build a large service area here for the A9. Part of the problem was that policy - both that of the local council and the national service station policy at the time - said that the A9 shouldn't have services as people should be visiting the bypassed towns instead. In 1998 an appeal finally gave them permission, but what actually materialised was less like a traditional service area, which was unlike impression the original plans had given. The restaurant looks like a courtyard, while the hotel is one of the road network's newer Travelodges. The Travelodge was expected to be joined by a Little Chef in 2001 but this didn't happen. Before the services opened, a few other developers attempted to get involved. Compass (the owners of Moto and other hospitality brands) then applied to build their own service area on the site in 2002. Since it opened, Broxden has managed to elevate itself to motorway service area status, appearing in most maps and road signs, including (an incorrect) one on the M90 northbound. Only a few miles down the road at Kingdom, another service area attempted to set up but struggled to get off the ground.